Ever heard the term "GORP," commonly referenced by hikers as "good old raisins and peanuts" or "gobs of raw protein?" 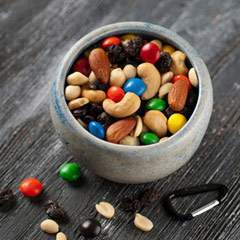 Call it what you like, but we bring you an original mix for those times you just want the standard, roasted and salted peanuts, almonds, cashews, raisins and chocolate buttons. Hit the trail!